In case it’s not clear: the game on the bottom appears to be a pretty blatant clone of the game on the top. The old-timey washed-out filters, retro graphics and bombastic language of the one lift heavily from the feel of the other. 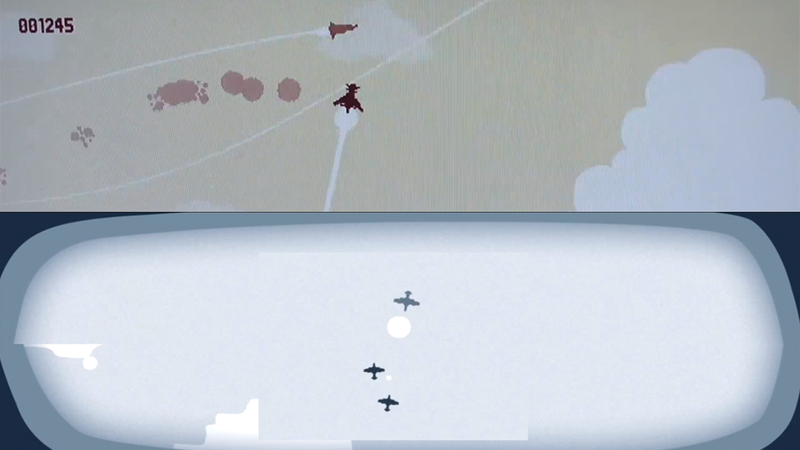 That first game, Luftrausers, comes from indie dev studio Vlambeer. Their most recent release is Ridiculous Fishing, a quirky, fun iOS success that blends shooting and fishing in a really awesome way. But Vlambeer’s triumph came only after the first version of their game—a browser title called Radical Fishing—was copied wholesale by the makers of Ninja Fishing. That game was able to come out on mobile phone digital storeforonts faster than Ridiculous Fishing. Cloning video games isn’t anything new but it’s seemed to have ramped up in the last few years, especially in the indie game space. Still, you have to feel especially angry on behalf of the folks at Vlambeer. They seem to be irresistible to people looking to pull a fast one on unsuspecting consumers. Still, if Luftrausers is anything like Ridiculous Fishing, it’ll be a far superior game than the one that attempts to lifts its design and appeal. We obviously endured a bit of a scare when news arrived of LUFTRAUSERS being cloned and released ahead of our own release schedule by another developer. This time, however, it's not 'just' the idea of the game that has been cloned, but also the visual style. This gives us much more room to fight the whole thing, and we fully intend to. The developer of the clone has gotten in touch with us after Twitter exploded and let us know that 'acttuly we genrated our assets, Codes and all newly' and that the gameplay as indicated on the screenshots 'is not there in game as in the screen shots. We just done those screnshots for public attraction'. They signed off with the note that 'we really dont think it links your game at all'. We simply can't deal with the stress of another cloned game, so we've gotten in touch with Apple and Google to see if there is a way for for the issue to be resolved without us getting involved in yet another clone war. We're more than happy to see games inspired by our works and we encourage anyone to practice game design and development by recreating personal favorites - but the clones of both Ridiculous Fishing and LUFTRAUSERS take 'inspiration' a step too far and into the marketplace. We're extremely exhausted from dealing with cloning and even though this is an important issue to stand up against, we had hoped that we could just release a game without the cloning debate happening for once. Ultimately, we refuse to accept this as a part of our industry. We believe that showing our games to our fans early is a better way of developing Vlambeer games than keeping secrets and just dropping the final result on people when it's done. Now that we've got the chance, we'd also like to take a few seconds to use the clone as an argument towards why LUFTRAUSERS is almost certainly not coming to mobile - we just can't find a way to make it work as well as it should on touchscreen devices. LUFTRAUSERS is still hitting PC, Mac, Linux, Playstation 3 and Playstation Vita - with the latter being the most interesting device for those of you who would like to play LUFTRAUSERS on the go. We've been wrapping up development and we are on schedule to release the game later this spring. Thank you so much once again to the fans, friends and press that have helped us out with Ridiculous Fishing and thanks so much to everyone for standing with us once again with LUFTRAUSERS. We hope this will be the last time we have to deal with this, but we're encouraged to know that if it's not, we won't be alone. P.S. We really like the idea of a Vlambeer clone game jam (https://twitter.com/folmerkelly/st…) - we might organize that after we're done crunching on LUFTRAUSERS. Hey..We are a students we have done this game with our own effort of 1 year. Tried a lot of tectonics to make this game on iphone. Few weeks back 1 guys mailed us like this a clone of our game luftrauser & all. We explained him SkyFar is not cloned from any of the other game. Soo we thought because some jealous.then we stopped. We used Many tools to finish this game. It took a very long time & a lots of effort to bring it out. In Media most of the things looks similar. Especially in GAMES & MOVIES. They have seen our advertised links recently many times we were publishing. Again they might of jealous.& Really using Bad words. they commenting on our Page,Links with the bad words. I there friend circles, community making all these issues with some 100s of people. In present-day law, it is upheld that game mechanics of a video game are part of its software, and are generally ineligible for copyright. The United States Copyright Office specifically notes: "Copyright does not protect the idea for a game, its name or title, or the method or methods for playing it. Nor does copyright protect any idea, system, method, device, or trademark material involved in developing, merchandising, or playing a game. Once a game has been made public, nothing in the copyright law prevents others from developing another game based on similar principles.